Online Test Series For SSC CGL (Tier-1) "at just Rs. 50 per Test"
SSCPORTAL presents Test Series for the SSC CGL (Tier - 1) examination. SSC is seen as one of the most reputed examinations in India. However, the exam calls for a comprehensive knowledge and understanding. An aspirant puts great effort and resources in preparing for the SSC CGL exam. However, no preparation can be seen as complete, unless, it is tested. Therefore, after the grand success of our last year's All India Test Series (AITS), we have come up with the Test Series for SSC CGL (Tie -1) examination. SSCPORTAL is committed towards furthering the SSC aspirants towards success. In this regard, it is important to provide you a platform for testing and evaluating your preparations, through a series of comprehensive tests. Therefore, the Online Test Series, has been prepared from the point of view of SSC CGL examination. The plan is to test the candidate through a number of mock examinations, online. Given the busy schedule of the candidates, and the time limitations of our busy life, the test series give you an opportunity to take the SSC CGL (Tier -1) tests, by your convenience. Through it, you would be able to take the comprehensive tests any day and anytime. Though a number of other institutions have been conducting similar tests, what distinguishes the SSCPORTAL from others is, the respect for the aspirant's interest. We understand the concern of a candidate. Thus, we have set the whole online test series at a very nominal price, with great flexibility in the number of tests that a candidate wants to take. An added benefit is the instant evaluation to the questions asked in the tests. This is a golden opportunity, which no serious aspirant should miss. 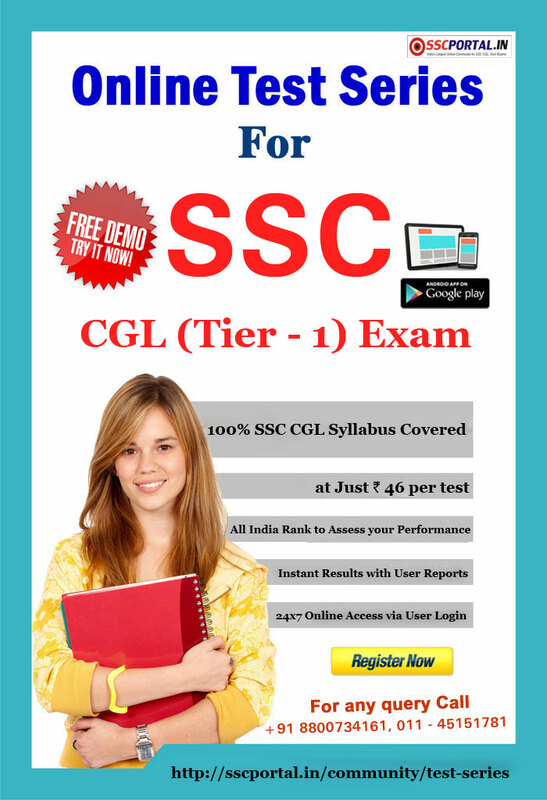 24x7 Online Access to SSC CGL Test Series via Mobile App User Login. Instant Results with User Reports. Specially Designed for People who cant come to Delhi for Reliable Test Series. Most Affordable Test Series with trusted Brand. Compare yourself and see!. You can give Tests on our Smartphone or Tablet using Our App (Android). Online Test Series (Batch-1) registration is now open, Join Now!.